What a year for books! 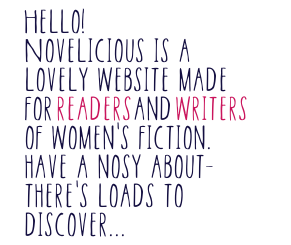 Team Novelicious have battled it out, and we're pleased to reveal our award winners for 2013. The whole team went a bit nuts over this one when it was released into the world. With a gorgeous composition, great illustration and that beautiful silver embossed title, Billy and Me looked like a classic even before it was published. This is the perfect cover for the lovely story within. Not only have the team at Sphere given us many wonderful, amazingly packaged books, plus super author content (from the likes of Fiona Walker, Ali McNamara and Carole Matthews), but they've also have really upped their game on social media too, with the introduction of The Little Book Cafe. It's been an absolute pleasure to work with the Sphere publishing team and authors this year and we can't wait to see what 2014 holds. Congrats, guys! Miranda Dickinson has the most amazing connection with her readers on Twitter. She always responds, runs brilliant giveaways and even lets her followers choose character names! Miranda is a must-follow and we've thoroughly enjoyed tweeting with her this year. This was a super tough category! We reckon Kev's enthusiasm for books is unmatched. He's a dedicated blogger, writes fantastic reviews (he even casts the characters in the books) and is an amazing supporter of authors both new and established. Well done, Kev! This debut was broken down into a series, released over November and December. We were hugely impressed by Lisa's comedic storytelling talents and reckon she's a 'One to Watch' in 2014. Romantic, mysterious and with descriptions so evocative that one of our team booked a holiday to Cornwall after reading it, A Cornish Affair was our top choice for Alternative Thursday Book of The Year. We were utterly blown away by this novel. Vivid, heartbreaking and beautiful in equal measure. We can't recommend this highly enough. Congratulations to Emylia Hall. Rowan is a very popular author in the women's fiction community and always has an encouraging word to say to new writers as well as having a great dynamic with her online readers. A few of the Novelicious team have met Rowan at various events this year, and she is so lovely and down to earth (we may have a bit of a crush). This year also saw Rowan release her book Woman Walks Into A Bar and donate 100% of her royalties to the Refuge charity. We heart Rowan. Huge congratulations to all of the nominees and winners. We've had a ball hanging out with you this year and cannot wait to see what next year brings. This library in The Netherlands was designed to look like a bookstore. It's gorgeous. We had lots of fun with the OED birthday word generator, which tells you what words were invented the year you were born. Earlier this year, we brought you five of the best bookish necklaces for under £25. Since this is the party season, we thought it was time for some luxurious literary jewellery. These sparkly delights all cost over fifty quid (some quite a bit more), but they would make lovely family heirlooms to be passed down through generations of book-lovers. 1. This delightful storybook necklace is handcrafted from silver and has the words 'Once Upon A Time' engraved on the front and 'Happily Ever After' on the back. If you prefer, you can personalise the book with your own choice of lettering. The book measures 1.5cm by 1.2cm and you can choose from a variety of chain lengths. £58 from Not On The High Street. 2. This teapot necklace is inspired by Alice in Wonderland and is handmade by British designer, Emily Sidwell. It's artfully dented and used-looking, and the lid opens to reveal a tiny silver mouse hiding inside. The necklace is first sculpted in wax and then cast in bronze and silver and it hangs on an 81cm bronze chain. £195 from By Emily. Earlier this week we interviewed the very funny Mhairi McFarlane. Today, we're giving away a copy of her latest novel Here's Looking At You. Anna Walsh’s glamorous career, beloved husband, Aiden, and exciting life in the bustling city of New York seem more than a world away as she lies on her mother’s sofa in Dublin. Before she can return to reclaim her life as it was before, she needs time to recuperate. Her body and emotional wellbeing have taken an intense battering that Anna doubts she will ever come back from. One thing is sure; she has to find Aiden no matter what it takes. The fact that he has seemingly vanished may complicate matters, but it won’t stop Anna from trying anything and everything to bring him back to her. The Walsh family are, first of all, large! Anna has five very individual sisters, all with hilarious quirks. They are also grippingly entertaining. She has an overpowering mother too, who has a funny habit of misunderstanding clichés, but tries to use them regularly in emails anyway, and a rather hen-pecked father. The novel’s premise, as is common in Keyes’ writing, is serious but she manages to take a challenging topic and explore it with both compassion and humour. There were times throughout the story when I gripped my chest with empathy for Anna’s heartbreaking bewilderment and intense pain, but just pages later I would find myself chortling at some wild escapade her sister Helen, an amateur detective, had managed to get herself tangled up in. A number of distinctly unusual characters are introduced as the plot progresses, including a flamboyantly gay neighbour, who loves to sing loudly and seems to be drawn to men who will treat him terribly (even stealing his pan sets), and self-proclaimed psychic who believes she can channel the voices of those long gone. People may be familiar with the story of Solomon Northup, as a film has been made from the man's memoir. The story itself, however, deserves to be read to get the man's own perspective on those twelve years and what they did to him. Solomon Northup, a free man of colour, was drugged and sold into slavery only to finally be freed after twelve long years seeing and experiencing the world through the eyes of a slave. However, knowing he does eventually find freedom does nothing to lessen the impact of this incredible story. Northup so eloquently and honestly describes his ordeal – both the good and bad parts – that it makes for one of the most shocking and compelling reads ever written. He has caring owners and vicious ones and comes close to death on many occasions. One of the most heartbreaking parts of his story though is what he witnesses around him. A female slave never fully recovers from having her children taken from her. Another's beauty proves to be her curse. Though the story is no doubt horrific, Northup manages to find some moments of joy and beauty. His rare talent as a musician means he gets access to the world of his owners most slaves would never see. He is also an incredibly talented craftsman and occasionally manages to find joy and pride in his work. The people he meets along the way both break and mend his heart and he finds strength in their courage and the bond he shares with them all. 1. Get some words down – even if you suspect what you’ve written is terrible, you’ve got something on the page you can work with. 2. Read your sentences out loud; you can hear if the weight and the rhythm are working. 3. Be hungry for the feedback of new readers – it’s such a relief to have someone playing in a manuscript with you when you’ve spent months in there battling on your own. 4. Try to leave a piece of writing at a point where you know what’s going to happen the next time you sit down with it. 5. If you get truly stuck, give it 15 minutes of staring at your screen – or your page – and then take yourself out for a walk. If you’re moving and in a different landscape, a solution quite often presents itself. Rebecca Solnit has this nice line about how we walk at the speed of thought – about four miles an hour – and I’ve always thought that made sense. Hélène Hivert’s childhood in shrouded in mystery and secrets and, in a determined effort to discover the truth of her family, she puts and advert in a newspaper detailing her quest and includes a photo. The photo is an old black and white of her mother and two men at a tennis tournament taken at Interlaken in 1971, and comes to the attention of Stéphane, a Swiss biologist currently working in Ashford, Kent. He has a clue to Hélène’s past, one of the men is his father and the other is his father’s best-friend. By responding to Hélène’s request for information, Stéphane instigates a flurry of written correspondence, via letter, email and text between the two of them. Cataloguing their independent discoveries as they delve into their parents' history and sharing their quest to uncover the truths kept secret from them for their entire lives, they reveal painful memories and develop a bond that will last a lifetime. The style of this novel is – in a word – beautiful. It works as a dual narrative as we follow the correspondence between Hélène and Stéphane. It’s both the journey of discovery into their parents’ past and the truth of their childhood, but also the progression of their friendship leading irreversibly to companionship. This style of narrative results in the reader getting caught up immediately in the lives of the character and creates a book that is unputdownable. Additionally, in amongst the pages of letters and emails, we are given the odd excerpt describing another photo or document from the time period; this enables you to form an even more detailed picture of the characters. Liz Trenow's latest novel, The Forgotten Seamstress, came out earlier this month as an ebook and will be out in paperback on 16th January. Here are a few questions Liz recently answered for our Novelicious readers. I write in the mornings when my mind is freshest – usually starting around 8.30ish and continuing till my stomach rumbles for lunch. I start by reviewing and editing the section I wrote yesterday, to get me back into the ‘zone’ and then I usually try to write between 1,000 – 1,500 words each day. I always write in my study, a small room at the front of the house, where there are not too many distractions. My imagination seems to close down after lunch so then I do research, admin, replying to emails, blogging and, when I’ve got to that stage, proofreading. Because my novels are based on historical events, I read about the lives of people who were there at the time. I also look to friends, family and myself for inspiration, but no fictional character is precisely a real-life character; they are usually an amalgam of many. I usually trawl magazines, newspapers, the internet and old photo albums looking for people who physically look and/or dress like my characters, and pin these images up in my study, so that I can ‘see’ them as I write. If you like to donate to worthy causes during the holidays or ask people to donate in your name in place of a gift, here are 10 literary options you might like to consider. 1. Book Aid International – Book Aid International provides books to libraries, hospitals, refugee camps and schools to support literacy, education and publishing in over 40 countries all over the world. As little as £6 could stock a community library with 36 books for children. You can also send reverse book tokens. 2. Give A Book – An easy premise. Simply donate a book and this charity will make sure it finds a needy recipient. Some donations go to cancer patients and children in deprived areas of England, while others go to book clubs for the elderly, which aim to promote reading while combating loneliness. Cost of one book? Just £5. 3. The Book Bus – One in six adults around the world have come through childhood unable to read and write, a situation mainly due to lack of books and opportunity to read. This charity’s little book buses – each one a piece of stretched magic loaded with books, materials and a crew of enthusiastic volunteers – delivers books to needy areas in Zambia, Malawi, India and Ecuador. £10 could buy and ship a set of five children’s books. If you’re looking to make some writerly New Year resolutions, entering competitions is a great way to boost your confidence while receiving constructive feedback from your peers. The Pinterest Prompt is an excellent place to start too. If you’re new here, this is how it works. We pick an image we like from Pinterest on the third Wednesday of every month at 2:30pm. You guys then use the image as inspiration for 200 - 400 words of fiction, which you post in the comments below. Each month, we’ll pick our favourite and the author will win a £20 Amazon gift card as well as a spot in our monthly newsletter, where we publish the winning piece of fiction. Last month you wooed us with tales of New York at Christmas. Seriously, you make it harder and harder to pick a winner, you talented lot. Vicky McMillan really caught our eye (and the eye of her hero, no doubt) with the possibility of a serendipitous, phone-throwing encounter leading to romance. Congratulations, Vicky. You’ll receive your gift card via email and your fiction will be featured in our December newsletter (hitting an inbox near you tomorrow). Without further ado, here is December's Pinterest Prompt. It is early December and Lydia, a career-hungry junior barrister by day and serial romantic by night, was urgently looking for some black socks to wear. Not finding any in her own drawer, she turns to her boyfriend's and gets the shock of her life when she sees an engagement ring staring back at her. A few weeks later Lydia and said boyfriend, Stephen, are travelling up to the Lake District to stay at her friend's boutique hotel for Christmas, which is owned by Katy and Jim. They're joined by Alex, David and Joanna who has her new man in tow. Then Lydia's ex walks over the hotel's threshold. Now that was completely unexpected. Thanks to a cranky boiler, the group are also joined by a handyman called Will. This cracking cast of characters proceed to celebrate Christmas with lots of food and booze, a few tensions, some home truths and romance. Plus drama. Lots of drama. Especially where an aga and a pregnant lady are concerned. I'm not going to give away the plot. Suffice it to say, Lydia's discovery of the ring earlier in the month consumes her thoughts. She has a packed and rather emotional few days. Luckily, the food is always plentiful to soak up the booze and the emotions. Mince pies, gingerbread croissants and a yule log are just some of the delights mentioned.